The other day I was attempting to have a cup of tea, while it was still hot, and attempt to relax. I sat on the sofa admits the madness of my life. Deep breaths in and out. Smile. Smile. Smile. Smile. After my tea, I was in full tilt mama mode. In the middle of juggling too many things and thoughts, my daughter started jumping up and down. She ran to me with my cup. I had left it on her play kitchen. “Look Mama there’s a heart. For you mama”. 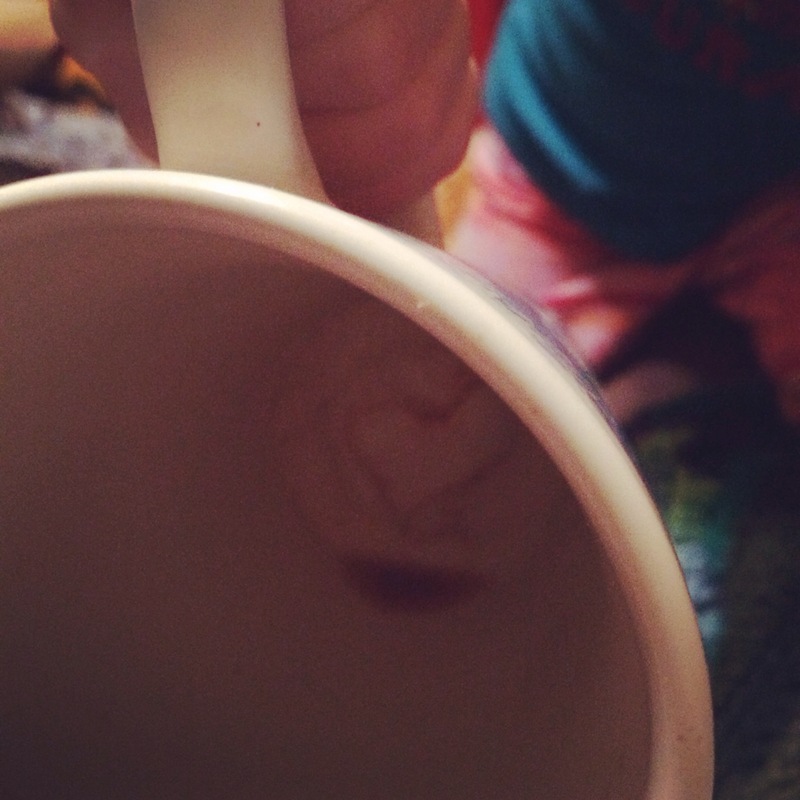 And there it was, in the bottom of my tea cup. Must mean something, right? Update on my journey teaching shakespeare to my kids. This is exciting. Truly exciting news in my little chaotic existence. As I stated I began reading Ken Ludwig’s book about teaching Shakespeare. Originally when purchased I was reading to teach my students. When I quickly assessed that he used it for his own kids, I thought, hey why not mine? One day while I was a couple of chapters in, Juliana asked me what book I was reading. I showed it to her and explained what it was about. She was smiley and said, “I want to learn.” Now, I originally thought I would read the whole book first and then give it a go but abandoned that because she was willing, eager and in a good mood. For parents of toddlers – you know take those opportunities when they come! She is 4 years old and spunky as all hell. I explained that she would repeat after me – she can’t really read yet so this is a bit of a challenge with the sentence strips. I pointed to the words as I said them so maybe we could get some sight recognition practice too. We started with “I know a bank where the wild thyme blows.” We said it a few times with the book and then I put the book down. but she wanted more. We went back and gobbled up “Where oxlips and the nodding violet grows”. It became a cute little phrase we danced to, sang to, cooked to and cuddled to throughout the day. She thought it was fun. Can you believe my astonishment that my four year old looked at me and smiled without missing a beat and said with a bucket of pride and sass, “I know a bank where the wild thyme blows. Where oxlips and the nodding violet grows”. I almost cried with joy. I quickly recorded it for Sunny and sent it to her. What a perfect way to say I love you and celebrate my daughter possibly embracing a shared love and passion of her mom and Auntie. It was magical. We played with the phrase and then left it alone. I was so excited that my daughter had two lines of Shakespeare tucked in her heart, maybe forever. She and I will be bound to Midsummer as long as we breathe. I was in an instant so grateful to Mr. Ludwig for reminding me that love and learning are seeds of happiness. Thankfully, it doesn’t end there! A few nights ago, my husband and I were sitting on the sofa in the throng of bedtime prep for Juliana and her 1 year old brother, Colin. Their grandmother was on the computer having a quick video chat. Juliana came over to us and said, “Mommy, I want to learn more Shakespeare.”. My mother asked her what she meant. She retrieved Ludwig’s book and opened it. She pointed to what I thought a random phrase and started to recite I know a bank. When I looked down, she was pointing to the words I know a bank!!! WTF. We got off the computer and began “Quite over canopied.” We created some hand gestures and within 15 minutes we were four lines of Shakespeare stamped on hearts. The following day my mother sent emails of pictures of woodbine, oxlips and the other flowers. Juliana decided we should plant them in our garden. I agreed. We are now on our way to having our very own Shakespeare’s Garden. Love is growing.